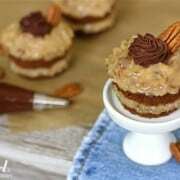 Layered German Chocolate Cupcakes with Chocolate Ganache are like a miniature form of the traditional cake. Just look at those layers of sticky coconut pecan frosting! I just can’t help it. Come March, I’m itching for a tall piece of German chocolate cake. I have Mom to thank for this annual craving, as she’s the one who’s been indulging my dad with this layered cake goodness on his birthday for as long as I can remember. Last year I made his namesake cake for the first time in my own kitchen, and gave it some modern flair. This year I gave the cake another little spin, introducing the fun of a layered cake to cupcakes. I made Layered German Chocolate Cupcakes with Chocolate Ganache! Yes, I split the cupcakes in half horizontally, slathered some of that sticky lick-every-last-finger-clean coconut pecan frosting through the middle and over the top…and then finished it off with a small swirl of thick chocolate ganache and a big ol’ pecan. It’s just the stuff my dad’s birthdays are made of! Prepare the chocolate ganache first, so it has time to set and thicken. Place the chocolate in a medium bowl. In a small pan over medium-high heat, bring the cream to a boil. Remove cream from heat and pour cream over the chocolate pieces. Stir until the chocolate is completely melted and the mixture is smooth and glossy. Let cool to room temperature. It will be very thick. If it is not thick and set when you’re ready to pipe it onto the cupcakes, set the bowl in the refrigerator for a bit, checking every 10 minutes or so. Preheat oven to 350°. Spray regular size cupcake tins generously with non-stick spray. Set aside. Beat egg whites in small bowl with mixer on high speed until stiff peaks form. Set aside. In a separate bowl, mix flour, baking soda, and salt. Set aside. 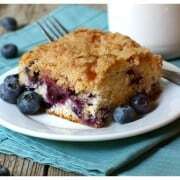 In a large bowl, beat butter and sugar with mixer until light and fluffy. Add egg yolks, 1 at a time, beating well after each. Blend in melted chocolate and vanilla. Add flour mixture alternately with buttermilk, beating until well blended after each addition. Add egg whites and stir gently until well blended. VERY IMPORTANT: Fill individual cupcake cavities only slightly more than half full. The batter puffs up during baking and then settles back down. If the cavities are too full, the batter leaks out over the rim of the cupcake cavity. It’s a big mess!! When all cavities are half-full with batter, rap the pan gently a few times on the counter to settle any air pockets. Bake about 17 minutes, or until toothpick inserted in centers comes out clean. VERY IMPORTANT: Let cupcakes cool in the pan for 15 minutes before removing to wire rack to cool completely. The cake is very tender…handle with care. Beat egg yolks, evaporated milk, and vanilla in large saucepan with wire whisk until well blended. Add sugar and butter and cook on medium heat 12 minutes, or until thickened and golden brown, stirring constantly. Remove from heat. Add coconut and pecans. Mix well. Set frosting in the refrigerator, stirring periodically. Chill until the frosting has a bit of stiffness to it before assembling the cupcakes. With a thin serrated knife, carefully slice the cupcakes in half horizontally. Spoon a bit of frosting onto the bottom layer and spread it out to the edge of the cake. Place its top on and then spread more frosting onto the top. Place the chocolate ganache in a piping bag fit with a medium star tip and swirl a bit onto the top of the frosting. Finish by pressing a whole pecan into the ganache. The cake itself is rather delicate, and the coconut-pecan frosting rather gooey. I found it best to refrigerate the cupcakes once assembled, to help stabilize them. Then take them out of the refrigerator 20 minutes prior to serving. Cake and coconut-pecan frosting adapted slightly from the recipe on the Baker’s German’s Sweet Chocolate wrapping, the only German Chocolate Cake recipe my mom has ever made! These were a hit for my boyfriend’s birthday, although I had to divert from my original plan of these cute mini cakes after both the cupcakes and cake (it made enough for 24 cupcakes and a 9×13 cake) stuck to all sides of their tins/pans. I ended up making dessert cups with the crumbled cake, topped with the frosting & ganache. Amazing!!! Well I’m glad to hear that you made lemonade out of lemons!! So glad to hear you enjoyed the flavors of this dessert, I’ve been so hungry for German chocolate lately! Hey thanks for the recipe. I am making them right now for my husband’s grandfathers birthday tonight!!! Thanks for letting me know, Amber – I hope your husband’s grandfather liked the cupcakes! Hey thanks for the recipes. I am making them right now for my husbands grandfathera birthday tonight!!! Can’t wait to make these tomorrow for my husband’s B-Day. He loves him some German Chocolate Cake! If you are looking for soft wonderful cakes, with yummy filling and amazing ganache frosting … Stop here. These might remind you of another type of cupcake—but these are way better. Brenda my mom is a big German Chocolate fan too – have you seen a recipe I post way back, for upside down german chocolate cake! it’s now my mom’s favortie!! These cupcakes look AMAZING!! – I should maybe try the upside down cake as cupcakes! Got the pans out so I can get the traditional German Chocolate cake made for your Dad tomorrow. Thanks for putting that picture of him in your story. Good memories! German chocolate cake is my favorite cake ever. If someone wouldn’t have created the chocolate cheesecake, than the German cake would be my favorite dessert. Love the cupcake version. So cute! 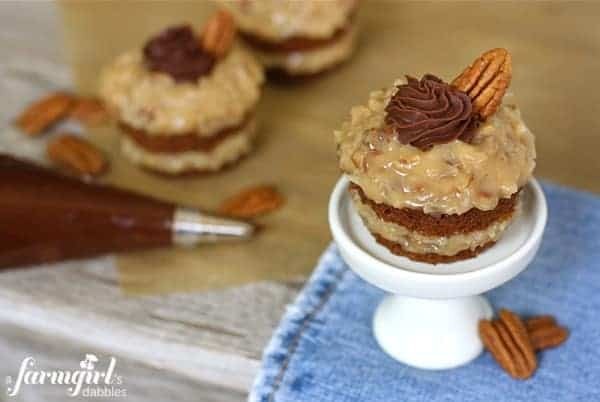 I love German Chocolate Cake, and these little cupcake versions look fantastic. Your recipes look sooo yummy! I can’t wait to try them! These look so cute and delicious! I can’t beleive I’ve never had German Chocolate Cake before. Do you mind if I quote a couple of your articles as long as I provide credit and sources back to your webpage? My blog is in the very same area of interest as yours and my visitors would definitely benefit from some of the information you provide here. Please let me know if this ok with you. Thanks! Your Dad is one lucky fella to have these for his birthday this year! Best wishes, I hope he has a wonderful year. These cupcakes, with that fabulous frosting are amazing! 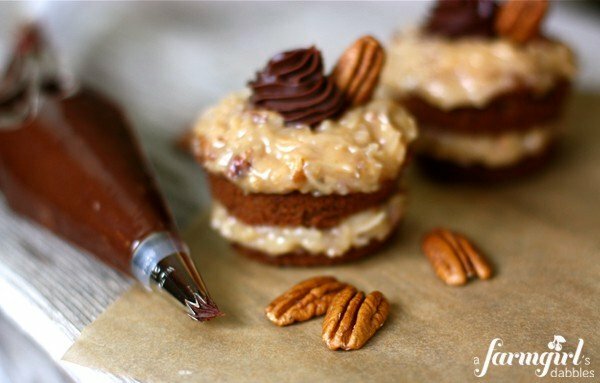 I love German Chocolate Cake and your version is beautiful! 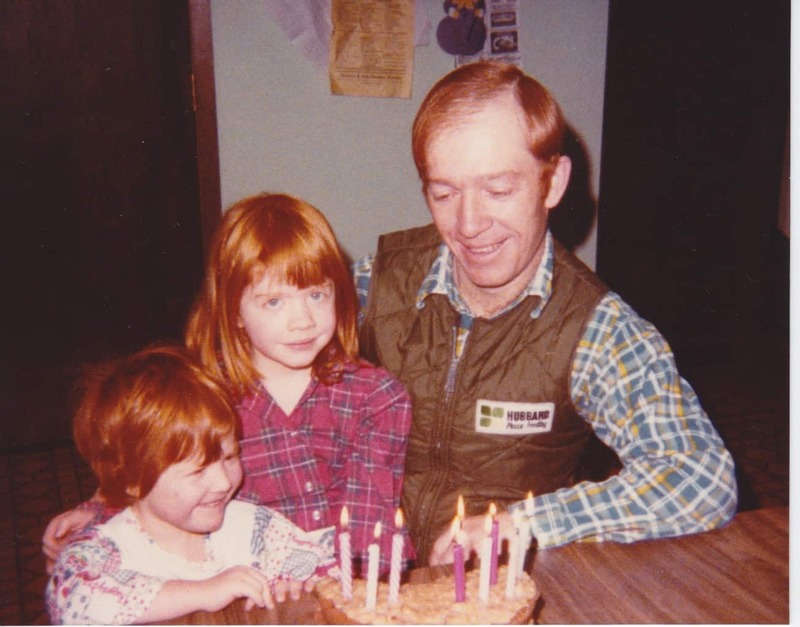 Thanks for sharing the picture of your family, too – love all the redheads! (I am the only one in my family.) Evernoted to make soon – thanks! How beautiful! I think I would love this cake to frosting ratio – you can never have enough of that gooey frosting! I just loved German Chocolate Cake growing up ~ my mom made it too. It always made the round of birthdays. The gooey coconut and pecan topping is so delicious but I’ve never thought of adding chocolate ganache! Brilliant idea and these look so positively gorgeous! Your dad is going to just love these, I’m sure. These look yummy as always! I love chocolate ganache, it always reminds me of the German Exchange trip circa 2004! German Chocolate Cake is my dad’s favorite, too! With my parents flying in next week I think I’ll make these for him. Thanks!! I bet he loved these! I would really like to try this one. I was in Germany a few months ago and found that all of the desserts were incredible! German chocolate cake was my dad’s favorite too. I am also keeping watch for fabulous cupcake recipes and ideas. My son is getting married in a little over a year and his bride would like to have cupcakes. Anybody with ideas just shoot me an email! 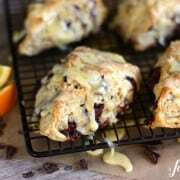 Karyl, check out this post: https://www.afarmgirlsdabbles.com/2011/03/21/i-am-baby-cakes/ – I’ve always thought these could be done for a wedding, too. The little random pearls are so fun and pretty. And they come in lots of colors for different color themes. Luks so cute..i am gonna try this soon. Oh my! What a fabulous idea! These sound delightful. German chocolate cake is one of my all time favorite desserts! The frosting is definitely the best part. These are so beautiful! Love the layered look! I am sure they taste amazing too! Happy Friday! These cupcakes look perfect! I will have to make them for my brother — it’s his favorite! Have a great weekend, Brenda!